This season is all about delicious comfort food and warming treats – and we cannot get enough of this Cornish winter duck recipe from our kitchen. 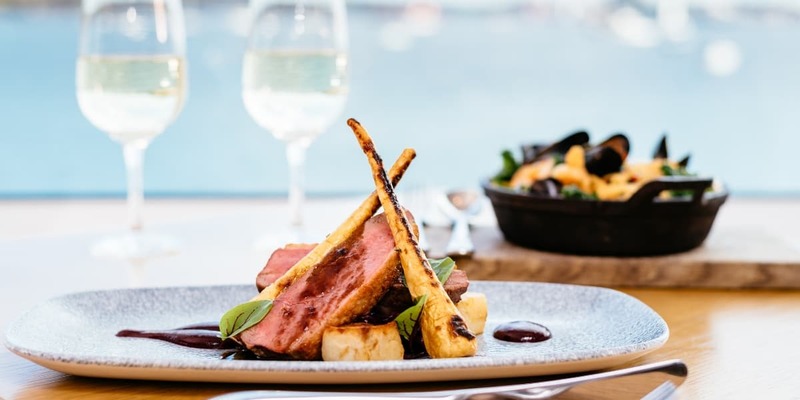 Serving two people, this pan roasted duck breast, fondant potato, spiced red cabbage, piccolo parsnip, cherry gel and honey port jus is just what the doctor ordered for a blustery winter’s night! Cut the red cabbage into thin slices, removing the core. Put all of the ingredients into a large saucepan and cook for approximately two hours until the cabbage is cooked. Melt the butter in a pan then add the potatoes. Colour the potatoes until golden brown. Add the chicken stock, garlic, rosemary, salt and pepper. Cook in the oven at 180 for 25-30 minutes. Remove from the oven once cooked and ready to serve. Add the cherry puree, water and sugar to a pan and bring to the boil. Check for taste, leaving sharp and not too sweet to cut through the natural fattiness of the duck. Reduce the liquid by half until the sauce sticks to the back of a spoon. Scrub the parsnips and parboil until soft but still with a crunch. Prepare the duck breasts by scoring the skin. Heat a pan – no oil is needed as there is enough fat in the duck skin. Place the breast in the pan, and leave until golden brown. Add the parsnips and toss in the oil created from the duck. Cook the breast and parsnips in an oven at 180 for seven minutes. ‘Paint’ a line of cherry puree on the plate. Carefully place a little cabbage on the plate. Make sure it is well drained or it will spoil the look of the end dish. Cut the duck breast in half or slice thinly. This is up to you. Lie the duck onto the cabbage topping with the crisped parsnips. Serve the sauce in a small jug to the side or drizzle a little on the plate. Want to impress your guests but don’t want the hassle of cooking? Why not visit our Water’s Edge restaurant instead and have this delicious dish prepared for you? Sit back and relax, knowing it’s all been taken care of. View our dinner menu here!